Mary Stoltzfus is thirty years old, splashed with freckles, and unmarried. In her Amish world, that qualifies her to be called an old maid. She is living her quiet schoolteacher life in the Lancaster County Amish community when she gets a surprising invitation in the mail one day. Would she come to Montana to teach? Of course not, she decides, fully at home in eastern Pennsylvania, where she can go out to eat in dozens of restaurants, do her laundry in a newfangled washer that’s powered by compressed air, and hire a driver if she wants to go farther than her horse and buggy can comfortably take her. What is there to do in Montana, she sniffs. But soon she becomes annoyed by the cracks in the floor of her one-room schoolhouse, the noise of the nearby road, and the two eighth-grade boys who try to make toilet paper cigarettes and nearly burn down the privy. Before long, Mary is on Amtrak, just to take care of her curiosity,” she explains to her mother. She arrives at a desolate station and meets Arthur Bontrager, who had signed the invitation and has come to introduce her to Beaver Creek School, dirt roads, and the fancy shed where she would live. When she settles into this world of mountain ranges and pine-tree majesty, her old buried questions-about why no man had ever been her match-have come along to live with her. 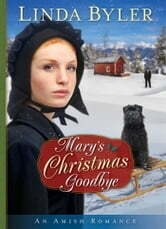 After she’s injured by wild dogs on her walk home from school, Mary faces new questions. Is she weak if she accepts a Bouvier des Flandres dog from Arthur’s friend? Who is the young woman in the photo at Arthur’s house? And why does she suddenly care? Does she really belong back in Lancaster?